Over the weekend I received a call from my friend Ariel. Her community garden was closing up shop for the season, but she had a huge quantity of chard that was still growing. She asked if I would like some of it, and of course I said yes. She came right over with a grocery bag full of beautiful rainbow chard. I thought about making a stir fry or a savory pie, but something about this late season treat called for a less wintry treatment. Instead, I thinly sliced the raw chard leaves and assembled a flavorful salad with sauteed chard ribs, olives, garlic, lemon, and mozzarella. The result was a gorgeous and richly flavored seasonal dish. Rinse and dry the chard. Tear the leaves from the ribs (reserve) and slice the ribs into 1/4 inch pieces. Heat the oil in a large skillet over medium-high heat. Add the olives, garlic, and chard ribs and saute with some salt and pepper for about five minutes or until the ribs are tender. Turn off the heat and set aside. 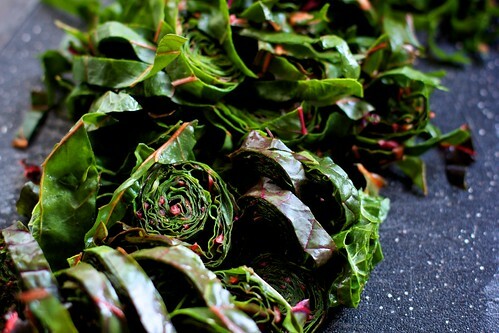 Take the chard leaves and stack them about five-high. Roll the leaves into cigar shapes and thinly slice crosswise. Toss in a large serving bowl with the lemon juice and lemon zest. Allow to rest for about ten minutes. The lemon juice will make the chard leaves slightly tender. 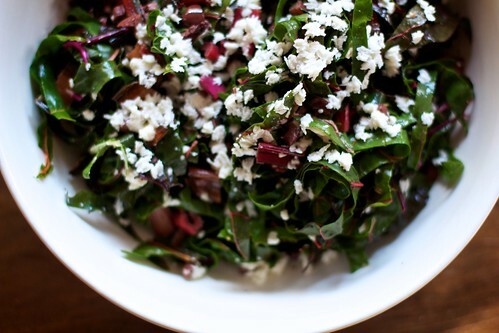 When the chard rib mixture has cooled to room temperature, add to the salad along with the mozzarella. Toss to combine and add salt and pepper to taste. This looks so beautiful and delicious! I love olives and any recipes that use them. Check out my page with some great olive dish recipes. Thanks for sharing, I can't wait to try this. 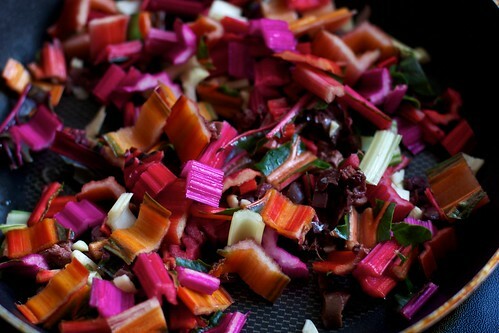 So jealous - "She came right over with a grocery bag full of beautiful rainbow chard." Sigh. Fantastic! I always think it's silly how recipes will state to remove the ribs and discard them, as they're great in soups and what not, but I hadn't thought of saute-ing them and adding them back in! Thanks, as always, for your inspiring recipes! And happy belated 7 years!